FLORIDA: Man Rants About Immigrants On Way To Celebrate Jesus With Immigrant Wife He Cheated On - Joe.My.God. People gathered outside Bethesda-by-the-Sea in Palm Beach just before service started. Many showed up to attend the 11 a.m. service in hopes to see Donald Trump. 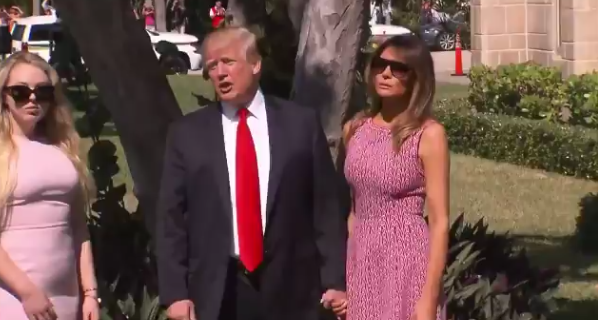 The first lady wore a sleeveless, red print dress. Tiffany wore a light rise color shift. Th.e president wore his customary suit, white shirt and red tie. The altar is covered in flowers and the church is packed.